During the last weekend of May, I went with my friend Cesar (Panama) to a live music festival in Nagoya called Spring Sakae. Sakae (栄) is the name of the downtown district in Nagoya. It is full of stores (for example, Lachic, which organized the event), people, high buildings and some famous tourist spots like the TV tower or the Oasis 21 complex. The festival lasted two days but I only went the first day. There were lots of artists performing in different live houses around Sakae. Basically, people could make their own schedule according to their taste and attend the concerts they were more interested in. Also for me it was a great opportunity to see a lot of locals in Sakae within a record time and without needing to pay extra! The groups were all Japanese and most of them were on their beginnings, although some of them were already quite famous. 小泉ニロ (Koizumi Nilo) / Nagoya Blue Note: the local was great and the music was not bad (Brazilian music). 城南海 (Kizuki Minami) / CIPHER the underground: my favorite of the festival, I really liked her voice. She had the ability to sing with a very high-pitched voice like in traditional Japanese Enka songs. 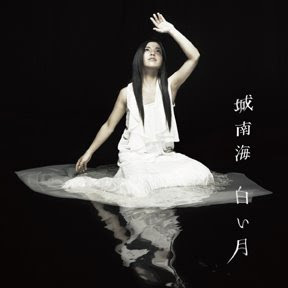 Last weekend I was in HMV (a music shop) and I saw a leaflet of her saying that her 3rd single, 白い月　(shiroi tsuki = white moon), was going to be released on the 22th of July 2009, and her 1st album will be on sale on August 19th! UPLIFT SPICE / PLUS PARK: this group was a bit more heavy compared to the previous ones and I really like the singer's voice, I think it is very special. The guitarist was also good and i loved his haircut, which covered his face completely. And the guy on the drums was also great. It seemed to be a popular group by judging the public behavior. AFNICA / Nagoya Blue Note: it was a very cool performance and the music was kind of Jazz. The best were the drums. Ayuse Kozue / Ozon: this was one of the stars of the night I think, she reminded me of the singers from the eighties. Good performance. Metis / Club Quattro: I don't remember liking it especially. It was a very nice day and I am glad I went because it was a very Japanese experience and I felt integrated with them. Everything was very well organized and after each performance you had time to go out and walk to the next local or to drink or eat something. Muchísimas gracias por el enlace de mi blog. All original content is Copyright ⓒ 2006-2016 Daniel Sangorrín López, distributed under the Creative Commons Attribution-Noncommercial-Share Alike 3.0 License . Information on this blog is provided "as is" without warranty of any kind, either expressed or implied.